Feeling a bit backwards today? Eat a kumquat! Why is a kumquat the backwards fruit? Well, Kumquats are the only citrus fruit that lets you eat the skin. Simply pop a tiny grape-sized kumquat into your mouth and chew. The skin is sweet and the juicy pulp is tart. It's a flavor sensation that only mother nature could create. 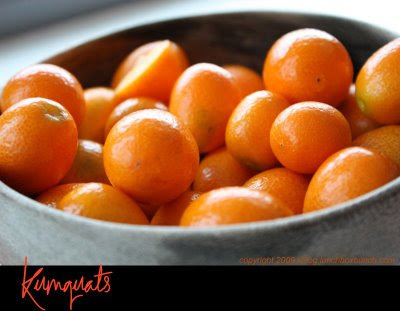 Nutritionally, kumquats are a great source of vitamin C! They also contain calcium, vitamin A, fiber and iron. How to eat: Eat raw! Or use in recipes as a creative substitute for any citrus ingredient. Including lemon or orange. And since you can leave the skin on, the prep is very easy! Just wash and chop. Kumquats are also high in pectin-making them the perfect addition to a jam or jelly recipe. Kumquat marmalade anyone? Yum. In season: Late autumn to mid-winter.